Pat Cullen is sales manager for HMS Products Co., Troy, MI; www.hmsproducts.com. Years ago, part rotations were handled with cams and slides within the transfer equipment and the finger tooling. This method, although considered “old school,” still can be effective at times. 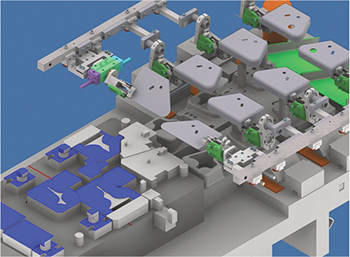 Transfer tooling and die processes have evolved significantly, driven by several factors including competitive market pressures and the desire to minimize scrap and reduce material costs. In-die part rotation meets both of these needs. Years ago part rotation was performed to maintain the workpiece parallel to the bolster of the press, and to eliminate camming operations. A two-out process was basically a single piece split in half to create left- and right-hand stampings with each hit of the press. Part rotations were handled with cams and slides within the transfer equipment and the finger tooling. This method, although considered “old school,” still can be effective at times. In cases where there are tight timing considerations between the press stroke and die stations, or where there is no room on the bolster for an idle station, a mechanical rotate operation can maintain a precise relationship between the degrees of rotation and the pitch-travel of the transfer unit. 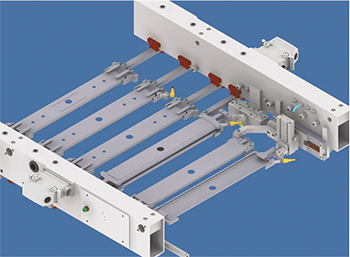 The other solution: a true servo electronically line-shafted to the press and transfer motion. Fig. 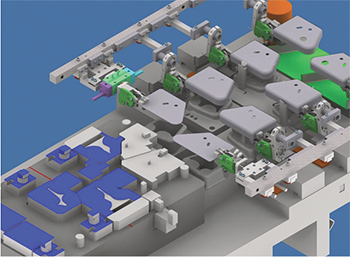 1—This two-out transfer process optimizes material utilization while creating additional space in the die. Stamped and separated two-out blanks. Pneumatic actuators also have become prevalent for rotating parts within a transfer die. Packaging and performance of the actuators has improved greatly in recent years, and transfer control systems now can back-check commanded vs. executed motion under the ram. These controls can even provide speed-compensation features to advance the firing point of a signal to a valve, as press speeds increase, to lead the motion. 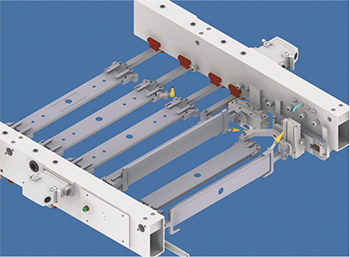 Pneumatic actuators also can be cleverly packaged to extend or reduce pitch travels on one or both transfer rails. They can grip the workpiece to allow improved handling of long, thin-gauge stampings, or to allow stampers to run unattached doubles. 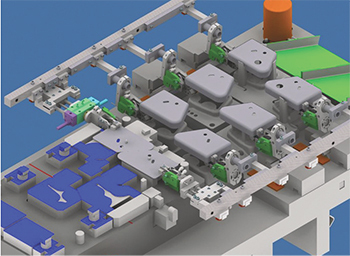 They also can provide blank/part separation to optimize material utilization or to simply provide more real estate between die stations and allow for additional operations within each station. There are, however, some drawbacks with pneumatic actuations. Many of the product enhancements described on the capital-equipment side are made to mitigate some of these issues. For example, sometimes air-driven actuators can stick. A part incorrectly presented to a die or a piece of transfer tooling out of place can create expensive repairs and generate downtime. Air pressure is supplied at a constant level to a transfer press, and as press and transfer speed increase, the air speed of the actuators typically does not. 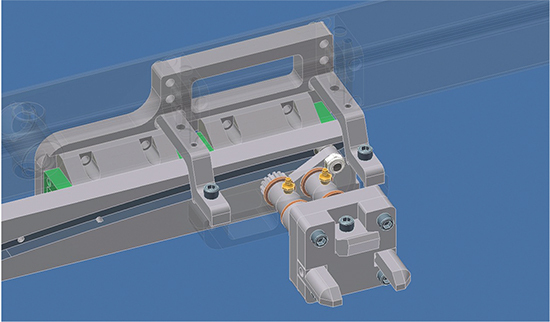 Stampers can face, and must address, some serious challenges when synchronizing longer slide motions on opposing sides of a tooling rail. This brings about the development of electric actuators. 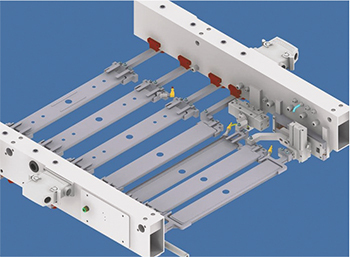 Electric cylinders, slide packages and rotate modules are becoming more commonplace in transfer-die applications as their performance (torques, timing and operating voltages) and packaging improve. And, the price point of these devices has dropped to where they begin to make sense in transfer tooling. Electric actuators could quiet many of the concerns stampers have with actuator synchronization and reliability. Small stepper motors with integrated controllers take the complexity out of homing, synchronization and feedback monitoring. These can be purchased with absolute feedback encoders, and typically are “point-and-shoot” types of controls, as opposed to electronic line-shafted functionality where a preprogrammed motion profile (or a series of profiles) and ramp rates are developed, and the device awaits an initiate signal. With a typical operating voltage of 12 to 48 VDC, stepper motors with integrated controls are well-suited for under-the-ram applications. Fig. 2—This process illustrates well the flexibility of transfer-tooling applications. Shown is a two-out stamping operation followed by partial part rotation, part stacking and in-die crimping. Upper and lower stampings shown flat. Stampings joined together as an assembly. One of the challenges here is predicting where these devices may be required in a future green-field transfer-press application. When stampers account for this up front in the design cycle, applying this capability to the capital equipment to satisfy a tooling requirement can be fairly straightforward. Priorities during system design should include connectivity, cable management and correct power-up sequencing to ensure a hands-free quick-changeover sequence. Let’s look briefly at two creative applications of transfer tooling that conserve material and open up die space. First, consider the two-out process illustrated in Fig. 1, where the material is cut from a coil strip and the stamped parts developed to optimize material usage and produce minimal scrap. Parts are nested in the coil and then run unattached. Both are moved away from the centerline of the press to create additional die space. One part is rotated 180 deg. to allow for even more die space and to further improve part handling. In the example shown in Fig. 2, two parts are stamped out in the direction of flow. The transfer runs at double pitch, and the parts are individually trimmed, formed, pierced and flanged. The parts then are stacked in the final operations to allow for the two stampings to be crimped into one finished component, which then is evacuated from the press. See also: HMS Products Co.